This year’s PAX event in the heart of Melbourne was actually my first brush with the event. Of course I always looked forward to the various stories coming out of what is arguably Australia’s biggest gaming convention, but until this year I hadn’t gotten the chance to get down and dirty on the show floor itself. Compared to EB Games Expo, PAX is a bit of a triple-headed beast in the way it caters to the gaming community. There are of course the AAA heavy hitters from the likes of Sony, Microsoft, Ubisoft, EA and Activision, as well as the slightly more obscure (but seemingly no less popular) board and trading card games. But the aspect that PAX is probably most renowned for –and certainly the aspect that for me defined the excellent time I had– is the crazy amount of indie titles on show. I’m loathe to admit that the only time I’m likely to get around an indie is if it reaches a popularity threshold that’s pretty damn high. Basically, if I’m playing an indie, there’s a good chance it’s only happening on the back of a recommendation from millions of others. The obvious downside of course is that it’s extremely likely that I’m missing out on some quality experiences. One of my favourite experiences of this year was Annapurna Interactive’s What Remains of Edith Finch, and to think that I may have missed that title through my own ignorance makes me a sad panda. This ought to be a crowning example of my ignorance in the indie sphere, as Asymmetric Publications’ adventure RPG has been out for over two months, yet PAX was the first I’d heard of it. Featuring a stark black and white style with hilariously animated stick figures that somehow are quite expressive despite their lack of traditional features (like hands and feet), West of Loathing is a classic adventure with some seriously witty writing. It is both a celebration and a parody of the adventure RPG’s humble origins, blending old school turn-based mechanics and item-based exploration with an over-the-top Western setting and a deliciously wry and sarcastic tone. Turns out I’m not the only one who digs this title, as it’s currently sitting on 10/10 on Steam and 88% on Metacritic. If you’re looking for a unique RPG that’ll make you chortle then West of Loathing is where you want to be. Featuring a retro pixelated art style, Blockpocalypse is a strange little fellow from Aussie devs Dime Studios. It’s essentially a 4-player party game (which can be played on or offline), where four intrepid characters either cooperate to survive in various apocalyptic-themed levels (such as Fire and Brimstone and Alien Invasion), or duke it out in adversarial modes. 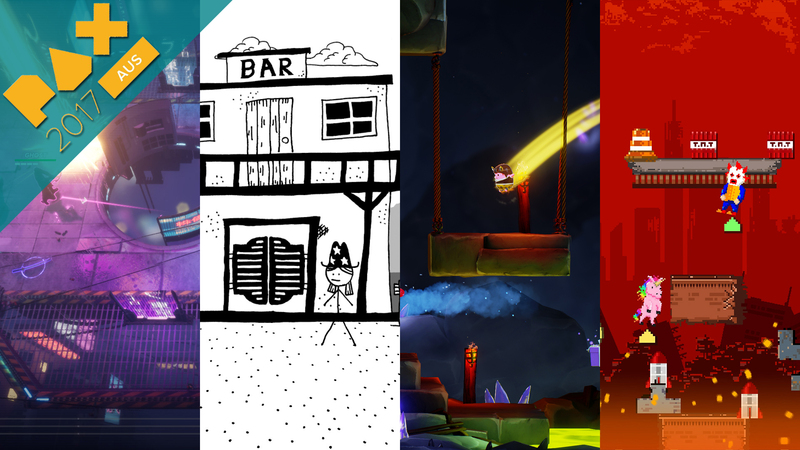 The main gameplay centres around the ability to pick objects up and arrange them to create makeshift platforms in order to survive a level’s perils. DYEGB’s Managing Director Zach Jackson and I were giggling like schoolgirls as we cooperated to tackle the simple yet hilarious platforming challenges. The hilarity is only aided by the weird and wonderful characters available to select, and the only thing better than arranging items in a long bridge over a gap is to do so as a tiny, fabulous unicorn and freedom bird duo. We also got a taste of the 2v2 adversarial basketball-inspired mode replete with throwable explosive weapons, jetpacks and a Predator-esque creature that doesn’t want either team to win. It was a fast and chaotic few minutes with more than a few clutch moments that elicited chuckles and swear words in equal measure. Even though the game is still in Early Access it’s clearly already a polished product, with a slew of modes, themes and skins to get the apocalyptic party started and keep it going. Hyperjam is a futuristic 80s-style free-for-all brawler that pits four players against one another in a battle royale scenario. Hyperjam is developed by another group of homegrown heroes out of Melbourne called Bit Dragon. With a top-down viewpoint centring on the action, weapons like katanas, crossbows and grenade launchers spawn randomly and can be used to bring death to your foes. There are a couple of clever wrinkles to the gameplay that elevated the relatively simple action, like the ability to call in airstrikes when you die in a given round (and earn yourself some precious points), and a cool perk system that favours the underdog. You earn points for scoring kills, and at the end of the round when there’s only one man standing, the player with the least amount of points gets to choose first out a pool of four perks. The next worst player gets sloppy seconds, and first place only gets the scraps. These perks are quite powerful (including setting opponents on fire, increasing movement speed and enhancing knockback abilities) and their buffs stack, meaning if you manage to stay the worst player for a number of rounds you’re going to be able to craft a fairly powerful character who might be able to turn the tides (unless you’re DYEGB’s Deputy Editor John Gray, then it’s probably a lost cause). Like Blockpocalypse, Hyperjam is a game that is best played locally with friends, and we’ll be keen to get our grubby mits on it once it releases. It’s coming to Steam first, but the devs mentioned that they’d love to bring it to consoles too. This was by far my favourite experience coming out of PAX, with some really cleverly simple gameplay redolent of classics like Super Smash Bros. Basically you do battle against three other players as you attempt to get above them and slam them betwixt your bum cheeks. If you manage to pull off an arse slam you’ll kill the other player instantly, or you can collect various weaponised pieces of underwear that spawn randomly and bestow their powers upon you (like hurling fire and poison). The arenas also have their own hazards, and avoiding these while trying to get above the other players and deliver death from above reminded me a lot of thumb wars…with weapons and magical undies. This looks to be a seriously fun bit of gear from local heroes Juicy Cupcake, and talking to one of the devs as he reached into his giant pair of underpants and handed me his card, it’s clear that there’s a huge amount of passion and sacrifice involved in getting the game to where it is today. The title is currently on Kickstarter and is set to come to Xbox and Windows PC early next year, with a PS4 release planned as part of their stretch goals. So these are my top indie picks from PAX 2017. If it’s one thing I noticed it’s that the titles which took full advantage of couch co-op were the biggest crowd pleasers, and you could see people returning again and again to those stations to have just one more go. Maybe it’s because we’re tired of hearing about our mothers’ sexual exploits from the mouths of sweaty racist squeakers on Call of Duty, but these games had the genuine laughter flowing and brought smiles to even the most cynical among us. PAX was a blast for many reasons, but these are the titles that really gave it a flavour of its own.